It's here! It's here! It's here! The Countdown to Geekmas 2013 starts TODAY my friends! Make sure to check in throughout the entire month of December for geeky, dorky and nerdy gift ideas. And don't forget to drop me a line if you think of something that might be a great addition to the list. Let's get started! 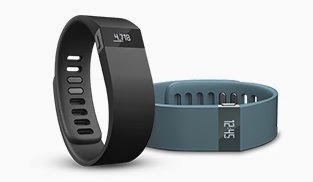 The first item on the 2013 Geekmas list is the FitBit Force. So why do am I suggesting you might be more interested in the FitBit Force? Now you might need to be strategic to get your loved one to move quickly and pre-order before it sells out, so be sure to drop some strong hints about your life and longevity. Or you can just go direct and treat yourself! Who says you can't give and receive unto yourself, right? In Canada, it's available for pre-order at online retailers like Amazon.ca and BestBuy among others (who have free shipping); in other countries check out similar retailers or the FitBit site.